Finally! I have been waiting weeks to pick up a SUPER STEAL on a NEW Rubbermaid Containers and Lids Set. Having containers with NO lids anywhere to be found drives me crazy! 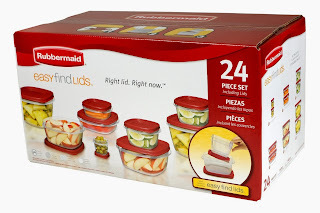 Amazon has the 24-Piece Set Rubbermaid Containers and Easy Find Lids for ONLY $10, which is 50% off.